Walter Bagehot (February 3, 1826 – March 24, 1877) was a British journalist, political analyst and economist, famous for his analysis of British Parliament and money market. Under his leadership The Economist became one of world’s leading business and political journals. Bagehot recognized that economics in not just a matter of the external, material aspects of financial transactions, but also involves the internal aspects of people's desires, motivations, and personality. Thus, he always emphasized social issues in his writings, and endeavored to make issues of government transparent to the public. Bagehot had an original and insightful mind, recognizing that the character of leaders was often more important than their political affiliation or beliefs. His work has continued to inform and inspire debate, contributing to our understanding of the functioning of human society and its improvement. Walter Bagehot was born in on February 3, 1826, in Langport, Somerset, England, the son of a local banker. He attended the University College London, where he earned a Master's degree in mathematics in 1848. He studied law and was called to the Bar, but decided not to practice, instead joining his father in the banking business, in Stuckey & Co. in the west of England. While still working as a banker, Bagehot started to write, first for some periodicals, and then for The National Review. He soon became the editor of the paper. In 1857, he met James Wilson, founder and editor of The Economist, a political and financial weekly newsmagazine. Bagehot married Wilson’s daughter in 1858. In 1860, Bagehot succeeded his father-in-law, James Wilson, as editor of The Economist. After taking over he expanded the publication's reporting on the United States and on politics, and is considered to have increased its influence among policymakers. Bagehot became influential in both politics and economics, among whose friends were statesmen George Cornewall Lewis and Grant Duff, Lord Carnarvon, Prime Minister William Ewart Gladstone, and the governor and directors of the Bank of England. Bagehot made several attempts to be elected as a Member of Parliament, but without success. He remained at the head of The Economist for the rest of his life. He died suddenly on March 24, 1877 in his home in Langport, Somerset, England, at the age of 51. Bagehot was a person with a whole variety of interests. He wrote on the topics of economics, politics, law, literature, and so forth. He remains most famous however for his three books: The English Constitution (1867), Physics and Politics (1872), and Lombard Street (1873). In addition to these volumes, he commanded substantial influence through his editorship of The Economist. The Efficient - the real face of the constitution, the way things actually work and get done. Instead of describing the constitution from the point of the law, as a lawyer would, Bagehot focused on the practical implications of the constitution, as experienced by the common man. The book soon became widely popular, ensuring Bagehot worldwide fame. Bagehot wrote Physics and Politics in 1872, in which he tried to apply the principles of evolution to human societies. The subtitle of the book reads: Thoughts on the Application of the Principles of "Natural Selection" and "Inheritance" to Political Society. The book represented a pioneering effort to make a relationship between the natural and the social sciences. Bagehot explained the functioning of the market, and how it affects the behavior of the people. For example, he believed that people tend to invest money when the mood of the market is positive, and restrain from it when it comes to a negative phase. Bagehot claimed that the personal example of the leader sets the tone for the whole governance. That is why “character issues” are so important for any government. Character "issues" still play an important role in deciding the potential candidate for any leadership position in today’s modern world. In his famous Lombard Street (1873), Bagehot explained the theory behind the banking system, using insights from the English money market. As with his analysis of the English constitution six years earlier, Bagehot described the English banking system through the eyes of a simple person, as experienced in everyday life. Bagehot showed that the English money system was solely relying on the central bank, the Bank of England. Bagehot had warned that the whole reserve was in the central bank, under no effectual penalty of failure. He proposed several ideas how to improve that system. 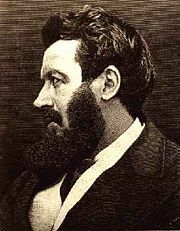 Bagehot’s work can be closely associated with the English historicist tradition. He did not directly oppose Classical economics, but advocated for its reorganization. He claimed that economics needed to incorporate more factors in its theory, such as cultural and social factors, in order to be more accurate in theorizing about economic processes. Bagehot was one of the first to study the relationship between physical and social sciences from a sociological perspective. In his contributions to sociological theory through historical studies, Bagehot may be compared to his contemporary Henry Maine. He also developed a distinct theory of central banking, many points of which continue to be valued. With his analysis of English and United States political systems in the English Constitution, Bagehot influenced Woodrow Wilson to write his Congressional Government. In honor of his achievements and his work as its editor, The Economist named its weekly column on British politics after him. Every year the British Political Studies Association awards the Walter Bagehot Prize for the best dissertation in the field of government and public administration. Bagehot, Walter. 1848. Review of Mill's Principles of Political Economy. Prospective Review, 4(16), 460-502. Bagehot, Walter. 1858. Estimates of Some Englishmen and Scotchmen. London: Chapman and Hall. Bagehot, Walter. 1875. A New Standard of Value. The Economist, November 20. Bagehot, Walter. 1879. Literary Studies. London: Longmans, Green and Co.
Barrington, Russell. 1914. Life of Walter Bagehot. Longmans, Green and Co.
Cousin, John William. 1910. A Short Biographical Dictionary of English Literature. New York, E.P. Dutton. Stevas, Norman. 1959. Walter Bagehot a Study of His Life and Thought Together with a Selection from His Political Writings. Indiana University Press. This page was last modified on 17 October 2016, at 19:06.